I saw the trailer for Dragon Wars (aka. 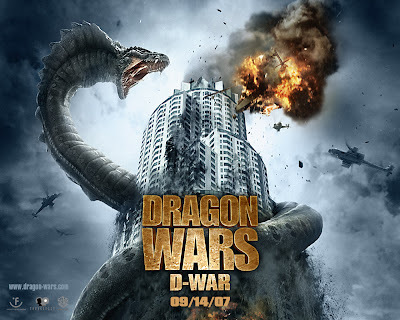 D-War) (2007) a while back, and was quite excited about it. It looks great, big explosions and battles, fantasy beasts fighting in a modern, realistic world and best of all, my favourite of mythological monsters, dragons! I saw it today on DVD and although it did have dragons and battles, unfortunately it was hardly a realistic world and wasn't all that great. I don't usually mind a poor plotline as long as there is enough mindless action to go with it, especially if the action is dragon orientated, but at times the script in this film just made me cringe and laugh at the same time. It begins with a pretty cool tale of Korean legend and heavenly guardians with evil serpents and ultimate dragon powers but how we get from there to the battle in LA later on, I do not know (try reading the plot on Wikipedia, it makes little sense!). I'm a perfectionist and I really can't stand it when there are silly points in a script, for example a journalist spending a day searching through every girl in LA called Sarah for no apparent reason and the government getting the whole military out to search for a girl who just so happens to be important, but for no reason! Now that little rant is over, it's important to realise that this film's size and budget is a first for Korean film, even though it pales in significance to Hollywood films (or so says the featurette on the DVD). It was directed and written by a rookie director/writer (Shim Hyung-rae) who is best known in Korea for his comic acting. Taking this in, you can't really expect a classic and it does the job for Far-Eastern folklore and impressive CGI dragons. Parts reminded me of Dragonball Z and there were also some nice parallels with King Kong (2005) and it has quite a few memorable moments. Watch the Korean story at the beginning (told by Robert Forster, also known as Artur Petrelli!) 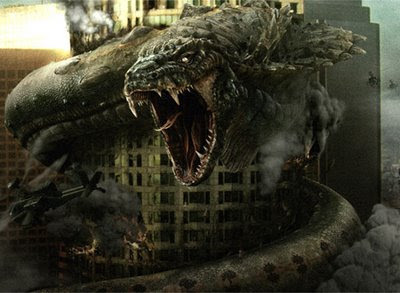 and then skip to the last 30 minutes to see the battle in LA and final encounter between the dark Buraki and good Imoogi serpents and you'll be quite pleased if you're after dragons, fantasy, Far-Eastern mythology and decent CGI.